Hyssop, Mullein & Ground Ivy assist your horse's natural self-cleansing process & appropriate mucus formation in both the lower & upper respiratory tract. Eucalyptus, Pine & Oregano support the respiratory tract's natural immunity & regeneration. 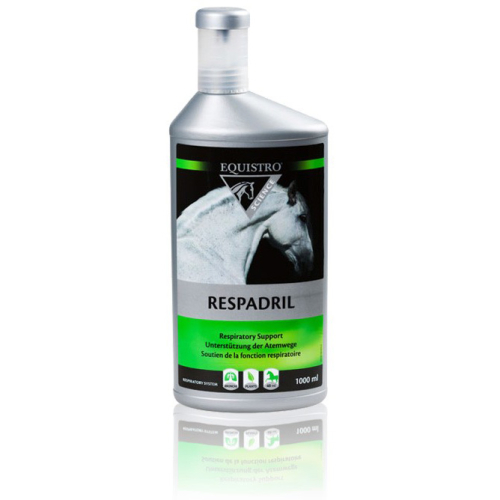 Equistro Respadril also contains Copper, which acts as an antioxidant. Feeding Instructions- Give a 5-7 day course. Administer either in your horse's feed or syringe directly into their mouth. Horses (500kg)- Give 40mls daily (either as a single amount, or split into 2 equal amounts). Ponies- Give 10mls daily (either as a single amount, or split into 2 equal amounts). If necessary, the amount fed can be doubled. Contraindication: This product is no longer safe to use when competing.